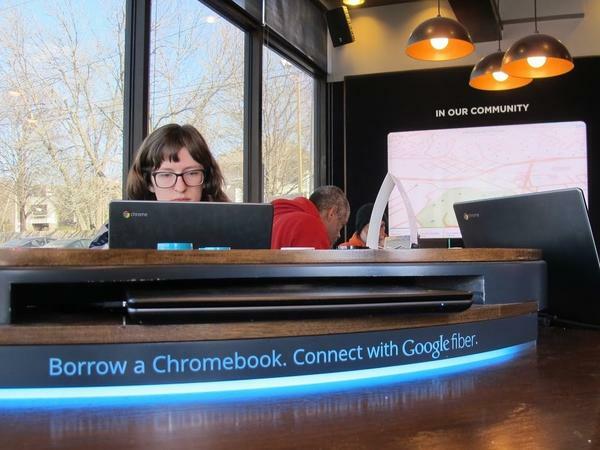 Since Google Fiber rolled out gigabit broadband in Kansas City four years ago, residents have enjoyed fast Internet connections, including what locals call "the world's fastest Starbucks." An AT&T worker splices cable for the suburb of Overland Park. Last month, the company became the third provider broadly offering affordable gibabit Internet to residents. Kansas City has some of the Internet's best service anywhere. Providers there jostle for customers who can now expect broadband that's about 100 times faster than the national average. Kansas City's a modest, Midwestern place. Residents are proud of their barbecue and baseball team. But Aaron Deacon says that now there's something else: inexpensive, world-class Internet. "Yeah, it's the best," he says. "Maybe Hong Kong's a little bit better than us, and Seoul." Deacon runs KC Digital Drive, a group set up to make the most out ultra-high speed Internet available in the city for $70 a month. "You have faster Internet here than anyplace else, and you can get it for cheaper than anyplace else. Because Google chose this market to build out in first." The network's still not done, but Internet connections running at close to one gigabit-per-second are easy to find. "We're sitting at the world's fastest Starbucks," says Ilya Tabakh, the COO of Edge Up Sports, a website for sports stats and news. He points out that the coffee shop has laptops hooked up to Google Fiber and says the difference is most visible on YouTube. "Click on a video, it's loaded," Tabakh says. "Click on another video, it's loaded. Click on another video, loaded. There is no waiting for anything." But many users are left waiting for programs to make use of all of that speed. Running normal applications on gigabit Internet is like riding a bicycle on a NASCAR track. For the moment, only a lucky few have any access. Everybody else is still on dirt paths. Not much money can be made figuring out a 200-mile-per-hour bicycle, or to step back from the analogy, an application to maximize the massive broadband. Toby Rush, who runs a Kansas City biometrics startup called EyeVerify, says the apps will follow as access expands. "When you can knock down the barriers — the roadblocks of near infinite bandwidth, real time, all the time, very cheap — it allows for a lot more digital things to happen, which is great for everybody," he says. In the meantime, Rush says, Google has made gigabit speed standard in Kansas City. "Everyone else is following suit, just making this high-speed connectivity a commodity." Mike Scott, the president of AT&T Kansas, stands by as workers splice fiber-optic cable before sinking it into someone's back yard. Last month AT&T became the third provider broadly offering affordable, one gig Internet here. Time Warner and other providers have also boosted speeds. "It's a fiber war so to speak," he says. 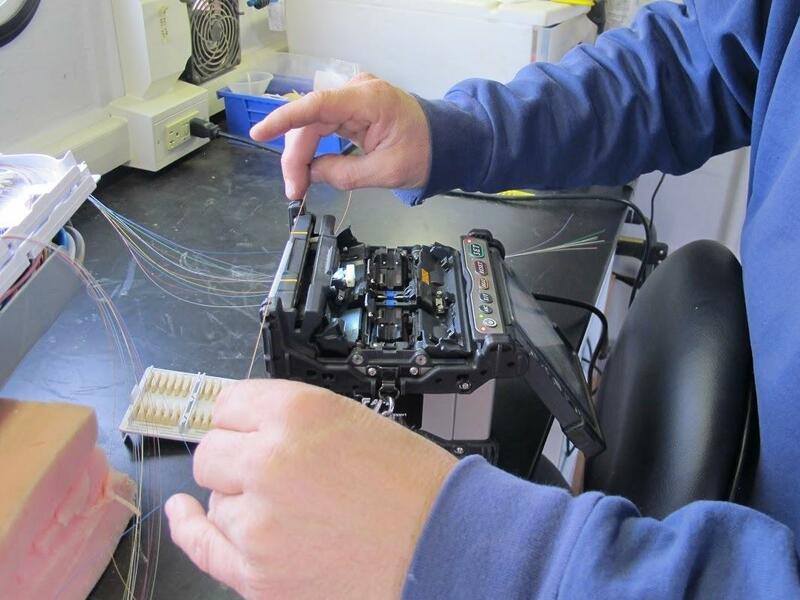 "We are literally standing in the trenches of a fiber war. And I think the customer ultimately wins in all this competition." But not everyone's a customer. In some Kansas City neighborhoods only one in five households has any type of Internet connection, let alone a fast one. Michael Liimatta runs a nonprofit called Connecting for Good that's trying to change that. "Our center here, you might consider it to be the front lines closing the digital divide in Kansas City," he says. Folks from this low-income neighborhood come in and use Google Fiber for free, but no one has it in the huge housing project across the street. Liimatta says he's sometimes disappointed that some of the expectations that the city had in terms of universal adoption, and loads and loads of free bandwidth, "never came to be." Not yet, anyway. Residents are still grappling with uses for super-fast Internet. Kansas City has some of the best Internet service anywhere. Providers there compete for customers who can now expect broadband that's about 100 times faster than the national average. But as Frank Morris of member station KCUR reports, four years after Google Fiber landed in Kansas City, people are still trying to figure out just what to do with all that speed. FRANK MORRIS, BYLINE: Kansas City is a modest Midwestern place. I mean, we're proud of our BBQ, baseball team, of course. But Aaron Deacon will tell you that now there is something else - inexpensive, world-class Internet. AARON DEACON: Yeah, it's the best. I mean, maybe Hong Kong's a little bit better than us and Seoul. MORRIS: Deacon runs KC Digital Drive, a group set up to make the most out of ultra-high-speed Internet available here for 70 bucks a month. DEACON: You can get faster Internet here than you can anyplace else, and you can get it for cheaper than you can anyplace else because Google chose this market to build out in first. MORRIS: The network's still not done, but Internet connections running at close to one gigabit-per-second are easy to find. ILYA TABAKH: My name is Ilya Tabakh. I'm the CEO of Edge Up Sports, and we're sitting at the world's fastest Starbucks. MORRIS: This one has laptops hooked up to Google Fiber. Tabakh says the difference jumps out on YouTube. TABAKH: Click on a video - right? - it's loaded. Click on another video, it's loaded; another video, loaded, right? There is no waiting for anything. MORRIS: Except for a really good use for all this speed. Running normal applications on gigabit Internet is sort of like riding a bicycle on a NASCAR track. For the moment, only a lucky few have any access. Everybody else is still on dirt paths. So you can't make much money figuring out a 200-mile-per-hour bicycle, or to step back from the analogy, an application to maximize truly massive broadband. But Toby Rush, who runs a Kansas City biometrics startup called EyeVerify, says the apps will follow as access expands. TOBY RUSH: When you can knock down the barriers, you knock down the road blocks up near, you know, infinite bandwidth, real-time, all the time, very cheap, it allows for a lot more digital things to happen, which is great for everybody. MORRIS: In the meantime, Rush says that the Google has made gigabit speed standard in Kansas City. RUSH: Everyone else now is following suit, so once again, making this high-speed connectivity a commodity. MIKE SCOTT: It's a fiber war, so to speak. MORRIS: Mike Scott, the president of AT&T Kansas, stands by as workers splice fiber-optic cable before sinking it into someone's backyard. Last month, AT&T became the third provider broadly offering affordable one-gig Internet here. Time Warner and other companies have also boosted speeds. SCOTT: We're literally standing in the trenches of a fiber war, right? And I think the customer ultimately wins in all this competition. MORRIS: But not everyone's a customer. In some Kansas City neighborhoods, only 1 in 5 households have any type of Internet connection, let alone a fast one. Michael Liimatta runs a nonprofit called Connect Me For Good that's trying to change that. MICHAEL LIIMATTA: Our center here, you might consider it to be the front lines of closing the digital divide in Kansas City. MORRIS: Folks from this low-income neighborhood come into the center and use Google Fiber for free, but no one has it in the huge housing project just across the street. LIIMATTA: Sometimes I'm a little disappointed that some of the expectations we had as far as universal adoption and, you know, loads and loads of free and cheap bandwidth never came to be. MORRIS: Not yet anyway. And residents are still grappling for uses for superfast Internet. For NPR News, I'm Frank Morris in Kansas City. Transcript provided by NPR, Copyright NPR.